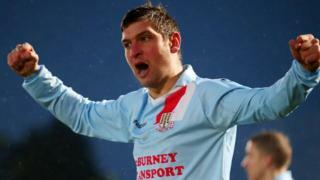 Matthew Tipton scores the winning goal for Ballymena United as the Sky Blues emerge victorious from a seven-goal thriller at the Warden Street Showgrounds. Gary Browne put the Bannsiders ahead in the festive derby clash, but Darren Boyce levelled with a header against his former club. Ian Parkhill restored Coleraine's lead before half-time but Tipton restored parity 10 minutes after the break. Allan Jenkins pounced on a mistake by Michael Doherty to give Ballymena the lead for the first time, then David Ogilby levelled, but Tipton's late header made it 4-3 for the hosts.